This is one question that is on every new homeowner’s mind. People who purchase homes in and around the greater Charlotte metropolitan area ask us this question as well. Our Emergency Locksmith in Charlotte, North Carolina provides more clarity on the subject. 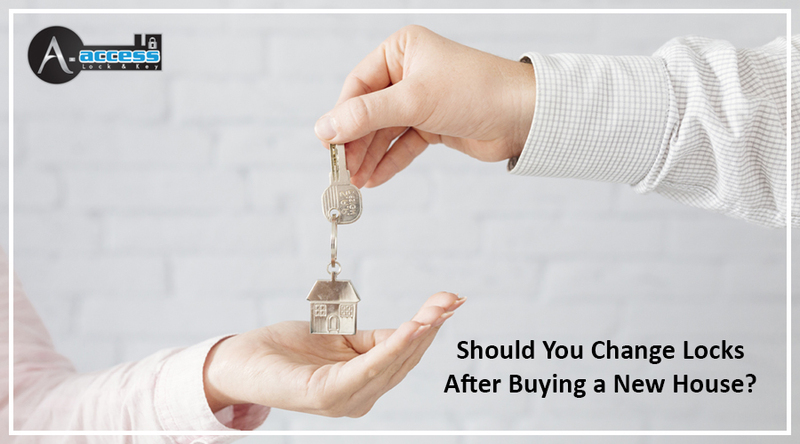 When you buy a new house, there are often so many things on your mind (mortgage payments, new neighbors, decorating, renovating, packing, and unpacking) that you forget to address your new home’s security. You might feel nostalgic remembering your realtor’s ceremonial presentation of the keys. This is especially true if you have just brought your house. 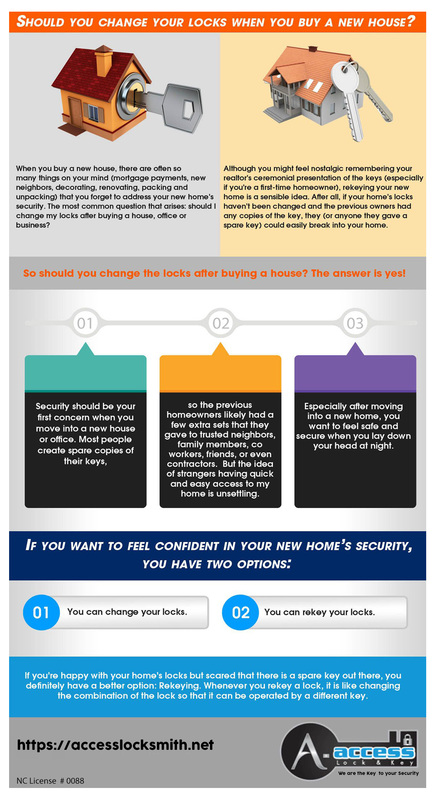 The most common question that arises is whether or not you should your locks after buying a house, home, or apartment. Should I Change Locks Upon Buying a New House? Whether you own a penthouse or a mansion, this educational infographic prepared by our Expert Locksmith at A-Access Lock & Key can help you make a decision. Lock Replacement: Yea or Nay? Even if you’re emotional and sentimental as a first-time homeowner, contacting a local Locksmith (our number is 704-545-5410) and availing new lock system installation for your new home is a sensible idea and helps with enhanced security. So, should you change the locks after buying a house? The answer is YES! After all, if the locks on your home haven’t been changed and the previous owners had any copies of the key, they (or anyone they gave a spare key) could easily break into your home. Plus, you have no idea whether the previous owners changed the lock or not. Most people create spare copies of their keys, so the previous homeowners likely had a few extra sets that they gave to trusted neighbors, family members, co-workers, friends, or even contractors. If this doesn’t worry you, then it should. You need to get in touch with a Locksmith right away. Enhanced security should be your first concern when you move into a new home, no matter how big or small. The idea of strangers having quick and easy access to my home is unsettling, especially after moving into a new home. You want to feel safe and secure when you lay down your head at night, and a professional Locksmith can help. Most Locksmiths will perform both of these services. If you’re happy with your home’s locks but scared that there is a spare key out there, you definitely have a better option: Rekeying. Whenever you rekey a lock, it is like changing the combination of the lock so that it can be operated by a different key. So, if you don’t want to get new locks for your new home you should rekey it. Rekeying your new home is a sensible idea and it’s the least you can do. This doesn’t just apply to new homeowners in Charlotte, North Carolina, either. If you have purchased a new home and live in the counties of Union, Mecklenburg, Cabarrus, or York, our team of talented technicians and Locksmiths can help secure your home. Don’t take the risk as you’re better safe than sorry. New homeowners and first-time buyers should make home security a top priority with an Emergency Locksmith in Charlotte NC like A-Access Lock & Key. Avoid lockouts and opt for enhanced security for your home and family. We are the key to your security! Get a free estimate from Charlotte’s #1 Locksmith A-Access Lock & Key. Call us at 704-545-5410 to immediately avail our Locksmith services. Keep your New Home safe and secure and call our Expert Locksmith!